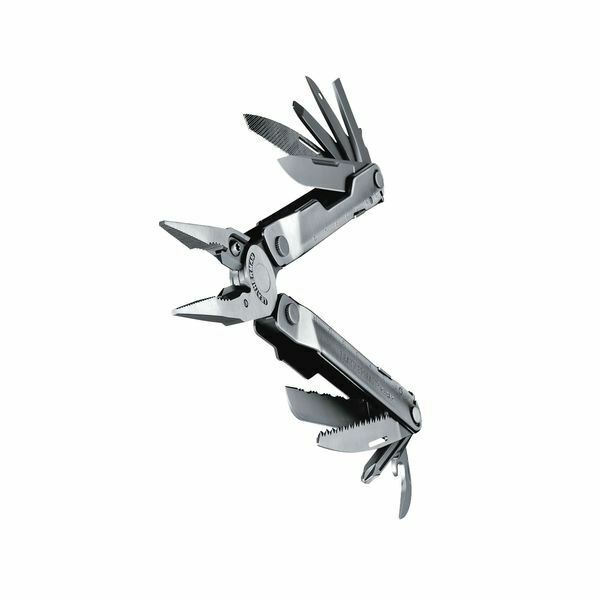 With the new Rebar, Leatherman fans will immediately recognize the iconic box-like shape found in Tim Leatherman's original PST design. The Rebar pliers have been optimized for strength and feature replaceable wire/hard-wire cuttersƒ? 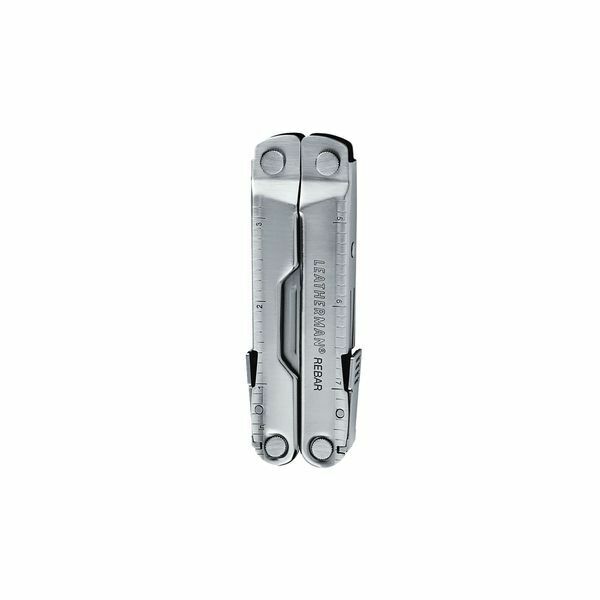 ?a first for a four-inch tool from Leatherman. With all the features to get even the toughest jobs done, in a smaller, slimmer size, the new Rebar is sure to be an instant hit on job sites and home projects the world over. The sale, possession, transportation, and use of knives are subject to a wide variety of local, state and federal laws. As a result, it is your responsibility to familiarise yourself and comply with all laws that might be applicable to your purchase, possession, transportation or use of the knives. To do so, we recommend that you contact your local police for their advice. By placing your order with us, you are representing to us that you will comply with all applicable laws and that you are of legal age and, furthermore, you agree to hold us harmless from your failure to comply with these requirements. We do not sell knives to anyone under the age of 18. 1 Needlenose Pliers: ​​A cast pinching tool with an angled nose for holding or manipulating materials, ideal for small objects or tight spaces. 2 Regular Pliers: ​​A cast pinching tool for holding or manipulating materials. 3 154CM Replaceable Wire Cutters: ​ ​Replaceable bypassing cutting blades crafted from 154CM, meant for cutting regular and light-gauge wire. 154CM will keep its edge three times as long as traditional stainless steel for less down-time in the field. 4 154CM Replaceable Hard-wire Cutters: ​ ​Replaceable bypassing cutting blades crafted from 154CM, meant for cutting hard wire. 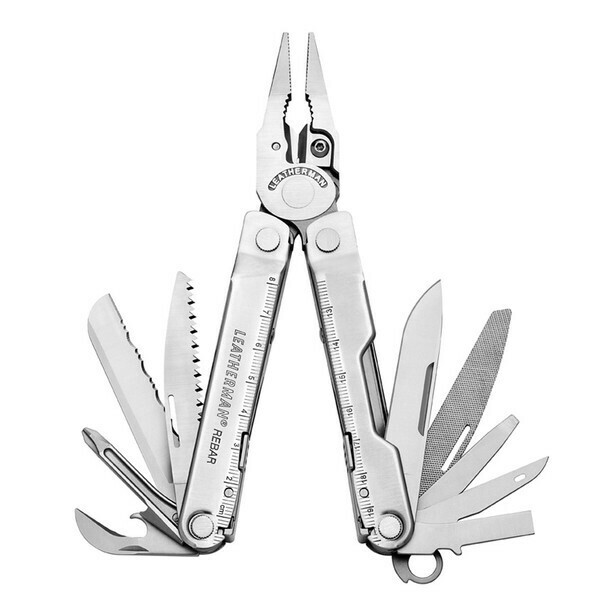 154CM will keep its edge three times as long as traditional stainless steel for less down-time in the field. 5 Electrical Crimper: ​​Found in the jaw of the tool and used for general purpose crimping of electrical connectors. 6 Wire Stripper: ​​A useful notch for safely stripping multiple types of wire. 7 420HC Knife: ​​A knife crafted from 420HC, a high-carbon stainless steel that is corrosion resistant and can be easily maintained. 8 420HC Serrated Knife: ​ ​A toothed blade crafted from 420HC stainless steel. Serrations grab and cut materials easily, making this style of blade exceptionally useful for cutting through rope or fiber. 9 Saw: ​ ​A toothed tool made from 420HC stainless steel that is designed to work on a pull motion, which requires less effort and has less propensity for breakage. The open-tooth design keeps the saw from filling up with material, allowing the user to complete a job without pausing to clean the tool. 10 Awl with Thread Loop: ​ ​An awl is a tool that can be used to create or enlarge holes by puncturing materials such as leather or canvas. They can also be used to start stair steps for hunting stands. The thread loop can be used for sewing materials together when necessary. 11 Ruler (8 inches/20 cm): ​​A precise measuring guide for determining length in inches or centimeters, up to 8 inches or 19 centimeters. 12 Can Opener: ​ ​A lever/punch style tool to assist in opening canned goods, perfect for camping or in survival situations. The blade on this tool has been ground in a way that it pushes the cut metal into the rim, keeping sharp edges from cutting the user as the can is handled. 13 Bottle Opener: ​​A tool that allows the user to pop the top on a favorite beverage. 14 Wood/Metal File: ​ ​A 420HC stainless steel tool with a crisscross pattern that forms a rough surface for the user to file or smooth both wood and metal surfaces. 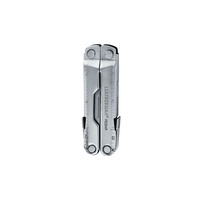 The file pattern on Leatherman files is extended to the end of the file as well as down the side to give a file stoke and/or a more precise file edge. 15 Phillips Screwdriver: ​​Created originally by Henry F. Phillips, this screwdriver is for use on Phillips head screws. 16 Large Flat Screwdriver: A flat bladed screwdriver tooled from 420HC stainless steel, intended for use on larger slotted screws. 17 Small Flat Screwdriver: ​​A flat bladed screwdriver tooled from 420HC stainless steel, intended for use on small slotted screws. 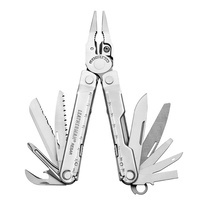 A All Locking Features: All locking features means that every tool and knife on the body of the handle, with the exception of the plier head, will lock into place. 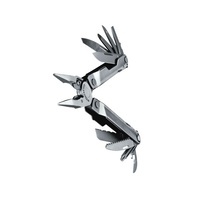 Note that the Crunch; however, does feature both all locking tools and plier head. The all locking design enables the user to operate individual tools safely and effectively. By locking them into place when fully open, the user can put pressure on the implement while safely completing the job, before manually unlocking the tool to stow it away. B Lanyard Ring: This secure ring is for attaching the tool safely and securely to a lanyard. Often people who work near water or on scaffolding attach their tool to a lanyard on their person to avoid losing the tool if it's dropped.